Wow! Marq, you never cease to amaze me. this one is way out-of-sight! keep on truckin’ down that cosmic highway, cheers! This is a killer poster, Marq. GREAT job! Ready to get my hands on one. 🙂 Best to you guys. I LIKEY. the Crowes look like they r tokin a little OG 47. 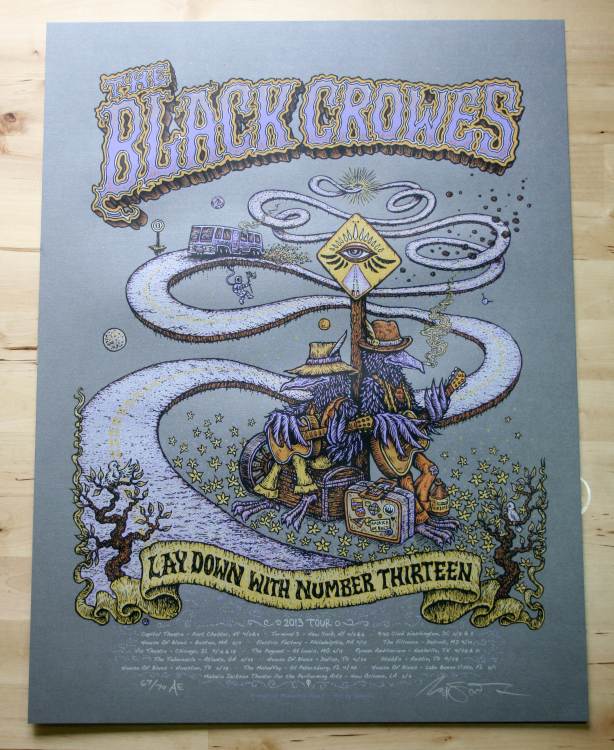 Is this the poster that comes signed by the Band with the VIP poster?, because I always saw some venue specific posters. Can you clafiry little gnome? I agree w richie hemp variant pls ! when will this be available for purchase? L@@k the smoke coming out of the bus window, awesome!! all of the ones sold at shows have a bent corner when will these be available to buy? All small number of an Artist Edition will be sold here after the tour. We really need a large AE version considering what happened to the majority of these at the shows. If TBC damaged them, why should the fans suffer and fans of this excellent art. They should pay to run another batch and put them up here. I would assume they were insured? will both versions be available on the site? 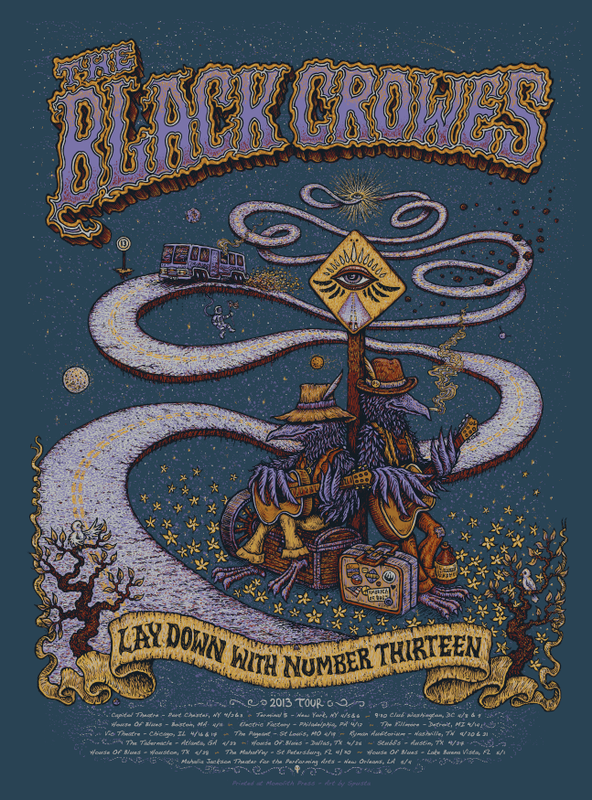 Both Tour editions of 500 will only be sold at the Black Crowes’ shows, and possibly online if any are leftover after the tour. There will be an artist edition made available here down the road. Ohh no, thats a shame. At least we get a shot when they are released here. Crossing fingers for more Swirl Shell paper, AMAZING in person!! bought 2 damaged prints the first night….contacted Marq about it…. gonna have it framed……so the corner ding wont be noticeable…. great print by marq…….by a great band…. went to the 1st 5 of 8 shows played…. hoping there are still some blues papers left by the Orlando show, even dinged up ones…love that blue! Bought a damaged purple in New Orleans. Really want a artist proof for myself. Have em both framed up, and gift the damaged to my friend. Drug her to the show, and after jazzfest when asked her favorite show of the weekend, her reply “my hearts still smiling. The crowes hands down”. I wanna pay it forward and give her a poster, but also need one for my wall! Please release a artist proof. I like the blue paper better than the purple I have, but some wicked different paper would be awesome. Foil would look amazing…..
Spusta Gnome – how will we know when the AE is available? Just saw TBC at HOB in Myrtle Beach and didn’t even see any of these beauties for sale! Would love to have a blue one. I am very interested in this print, anyone have one available? caught the chicago show …wasn’t able to get a poster..any proofs lying around? artist (in my free time) and a big fan of your work! keep killin’ it!